There’s something about finding interesting eats at an unlikely location that really gets the ol’ food writer’s blood pumping. Authentic ghormeh sabzi at an Oakland Hills delicatessen? Hell to the yes. Cambodian meat skewers from a hole-in-the-wall donut shop? We hardly knew ye. So when I spotted a sign for “Organic Soul Live,” a pop-up restaurant with a vegan soul food menu created by a guy claiming to be Isaac Hayes’ former personal chef, located right in the heart of Oakland Chinatown — inside a Tutti Frutti frozen yogurt shop of all places — I knew I needed to check it out. But what kind of expectations can you pin on a soul food joint, vegan or not, sharing digs with a tiny, nondescript fro-yo shop — no real kitchen to speak of, counter seats for maybe two people, just a brief menu taped to the window next to a printout of the chef’s (likely self-penned) Wikipedia entry? I don’t know about all that. What I do know is that the little bit of food I ended up trying at Organic Soul Live was good enough to have me rushing back to my laptop to tell you to go check it out. 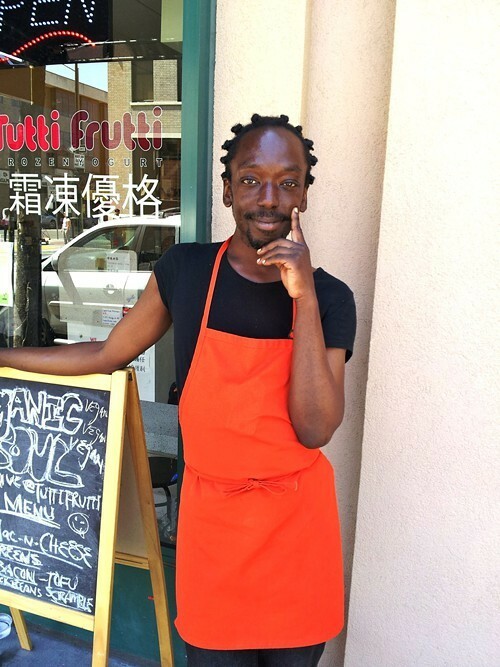 Elijah Joy, in front of the Tutti Frutti frozen yogurt shop that houses his vegan soul food pop-up. Anyway, Jesus didn’t come over the weekend, so on Monday I had the good fortune of trying an order of Joy’s “four-cheese” mac and cheese — a vegan version of his mother’s recipe, he later told me. I kept my expectations in check when the chef scooped me a little plastic tub full of brownish, slightly curdled-looking pasta, served at room temperature. But lo and behold, Joy’s garlic oil-infused mac was rich and unctuous and super-savory; it even had a little bit of crisp-edged goodness — the best part of any mac and cheese worth its salt. Vegan readers, feel free to call me out on this cliché, but if Joy had told me the dish was made from real cheese — not a mix of commercial soy- and rice-based “cheeses,” plus a cream sauce he makes out of nutritional yeast — I wouldn’t have blinked. He had me fooled. 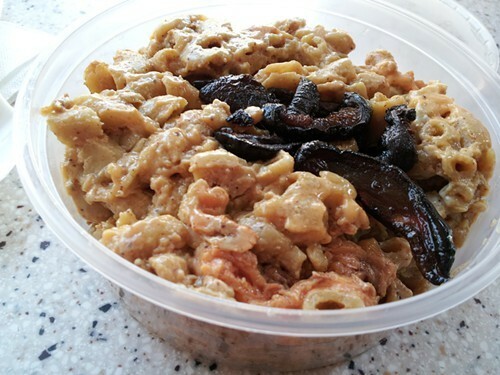 Even more impressive was the shiitake bacon that was sprinkled on top of the mac and cheese. Joy explained that he simply roasts slices of shiitake mushroom in olive oil and Bragg’s Liquid Aminos. A quick Google search tells me Joy isn’t the first vegan chef to use some variation of this technique, but to me this “bacon” was well-nigh miraculous: smoky without tasting burnt, with a crispness and a toothsomeness that made for a pretty spot-on approximation of fried thick-cut bacon. Joy offers samples to just about everyone who walks in, it seems, so I had a chance to try a bite of a couple other menu items: a tofu curry (fine but unmemorable) and some wasabi collard greens, which is a product Joy is trying to market to local health food stores as “Go-Go Greens.” These were more like an Asian-inspired salad than traditional Southern greens — the finely cut collards weren’t cooked at all, aside from being massaged in citrus juice and various spices. Again, I only had a bite, but found the greens surprisingly tender and well-balanced, given the prep method. When Joy and I chatted later, he told me the collaboration with the frozen yogurt shop was simply a happy coincidence — he’d been cooking at a nearby commercial kitchen when he answered a Craiglist ad put out by the Tutti Frutti owner, who was looking for a chef to creatively share the space. Organic Soul Live has been open there for about a month now. Anyway, I’m no expert, but doesn’t it seem like you can make the case that Oakland is a kind of mecca for vegan soul food — what with Souley Vegan holding court in Jack London Square, and eco-chef-activist and Vegan Soul Kitchen author Bryant Terry reppin’ Oakland on Emeril and Martha Stewart? Go ahead and add Elijah Joy to the mix. Joy, for his part, says he prefers not to be limited by a term like “vegan soul food.” For now, the chef seems to just be getting a kick out of running what he thinks might be the only black-owned business in Chinatown. The response from the community has been positive so far, he says, with sales doubling from the first week to the second week. According to Joy, customers run the gamut from African-American ladies with strong opinions on greens to "Whole Foods hipsters" to Chinatown locals. If you’d like to check out his food, Organic Soul Live is open from 12 to 9 every day — until Jesus comes, as Joy puts it. Got tips or suggestions? Email me at Luke (dot) Tsai (at) EastBayExpress (dot) com. Otherwise, keep in touch by following me on my (brand spankin’ new) Twitter account, @theluketsai, or simply by posting a comment. I'll read ‘em all.